Wychwood King Goblin English Strong Ale is a popular Ale available from Tesco Groceries in 50cl to buy online. Visit Tesco Groceries for the best price for 50cl of Wychwood King Goblin English Strong Ale or compare prices on our other Ale products. Wychwood King Goblin English Strong Ale. An Extraordinary Beer of Exceptional Quality. Only ever brewed under a full lunar moon, with Crystal malts & Sovereign hops for a rich, smooth sublimely satisfying taste of pure beer indulgence. Where to buy Wychwood King Goblin English Strong Ale ? Wychwood King Goblin English Strong Ale Supermarkets & Stockists. 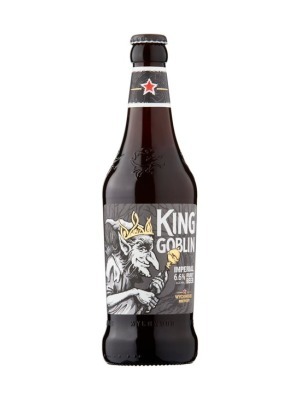 You can buy Wychwood King Goblin English Strong Ale online in most retailers and find it in the Ale aisle in supermarkets but we found the best deals online for Wychwood King Goblin English Strong Ale in Tesco Groceries, DrinkSupermarket.com, and others. Compare the current price of Wychwood King Goblin English Strong Ale in 50cl size in the table of offers below. Simply click on the button to order Wychwood King Goblin English Strong Ale online now.